The University of Washington Huskies are now 10-1 after defeating Arizona State decisively last night in Husky Stadium. They are also back on top of the Pac-12 North Division after a week with Washington State on top. The game started a little rocky for the Huskies. Quarterback Jake Browning looked as if he hadn't forgotten the USC game. He threw two interceptions and wasn't connecting with down-field Huskies. The defense, however, looked very good and even intercepted a pass in the end zone to stop an Arizona State drive. By the end of the first half, Arizona was scoreless and the Huskies had 24 points as Jake suddenly came back and played like his usual self. The Sun Devils didn't have much of a chance. They did manage to score 18 points in the game but the Huskies out-classed them in every way and beat them with 44 points. Like a lot of games this season, the Huskies put in second-stringers toward the end. And they still managed to score. This is the 8th game this season the Huskies have scored more than 40 points. So the Huskies go into the Apple Cup, the annual cross-state rivalry game against the Washington State Cougars, with a 10-1 over all record, 7-1 in conference. In other good news, the Cougars lost to the Colorado Buffaloes yesterday. That gives them an 8-3 four scenarios I lined out: Cougars lose; Huskies win. overall record and 7-1 in conference). This was the best possible outcome of the day. But the Pac-12 North title will still come down to the Apple Cup. If the Huskies win the Apple Cup, which is in Pullman this year, they will finish 8-1 in conference and 11-1 over all and the be the North Division Champs. That means they play the South Division Champs in the Pac-12 Championship Game on December 2nd. That came is held in Santa Clara, California at Levi Stadium (which I think is where the San Francisco 49ers lose a lot of games). 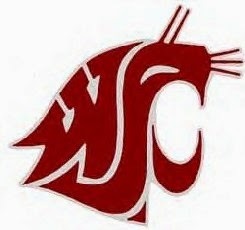 If the Cougars win the Apple Cup, they will be 8-1 in conference and 9-4 over all. Since in-conference record trumps overall record, they will be the North Division Champs. The loser of the Apple Cup will probably play in the Rose Bowl on New Years Day against a Big 12 Conference Team. The South Division Champ will be either USC or Colorado. Utah lost to Oregon yesterday and took themselves out of contention. USC plays Notre Dame next week and Colorado hosts Utah. If the Huskies win the Apple Cup and win the Pac-12 Championship game, they have a chance to be back in the playoffs. Right now the Huskies are at #6 in the CFP rankings. But #5 Louisville lost yesterday. Ohio State and Michigan State are #2 and #3 but they play each other next week so one of them is going to lose. So there is a chance for the Huskies to slip into the #4 slot again (or maybe #3). But they have to win the Apple Cup and be the Pac-12 Champions. Which means Jake can't play like he did against USC and the first quarter of yesterday's game. As usual, the CFP Rankings don't come out until Tuesday. The final announcement of who's in the playoffs (and the rest of the CFP Rankings) will be December 4th at 9:00 AM PST. That's a Sunday. Finally, the AP Top 25 Rankings for this week just came out and they can give a clue to the CFP Rankings. Last week we were #7 in the AP poll (and #6 in the CFP Rankings). Today we're #6. Other Pac-12 teams ranks are Colorado at #9, USC at #12, Utah at #21, and WSU at #23.